Josh Groban is an American singer, songwriter, actor, and record producer, known for his remake of the famous song “You Raise Me Up”, which led to his first Grammy award nomination in 2005 for the Best Male Pop Vocal Performance category. He has been touring the world through 2018 and even made it to the world’s most famous arena, Madison Square Garden. 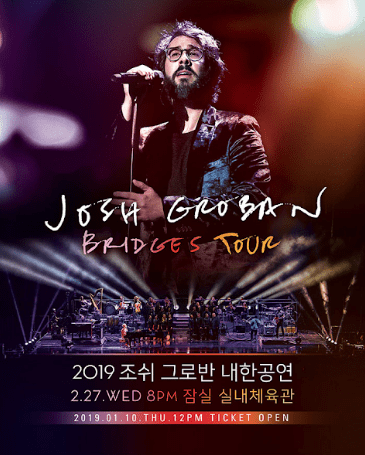 After visiting the Philippines and Singapore, Josh Groban Bridges Tour is coming to Seoul this February 27th for a unique performance at the Jamsil Indoor Stadium. The facilities have a capacity of 13,595 seats. For more information and booking, please check on Interpark.